THIS was a game-changer for me. Something I hadn't even thought of doing. Well, until I did, of course, and realised how much it was helping me. And now I love to share how journaling every day - it'll take 15-20 mins each day - can help with achieving your weight loss goals. It goes hand-in-hand with any diet, any goal that you're committed to. Seven emails from me to you, over seven consecutive days, with prompts and ideas for that day's journaling. all based around focusing on losing weight with ease. What have you got to lose by giving this practice a go - except maybe a few pounds?! THIS is what you haven't factored in to your diet, your food thinking. For me? Nothing short of life-changing. SIGN UP + GET STARTED! 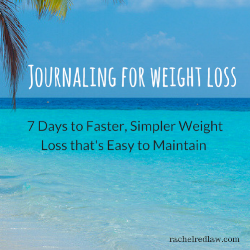 Want the free 7-day Journaling for Weight loss course?